I’ll start this case study by listing a few numbers. I’m guessing you’ll know what ties them together. The WordPress content management system now powers almost 30% of the web and accounts for over a quarter of the world’s top 10,000 websites. Those are staggering numbers for a code base which is only a little over a decade old. Needless to say, commercial opportunities within the WordPress ecosystem are always expanding. And one of the most obvious opportunities is developing websites for clients using this scalable and very flexible platform which can be used as a foundation to create any type of site a client may require. For most of you reading this, operating within the administrative side of WordPress is almost second nature. We log in, change themes, install plugins, drag and drop widgets, and publish content without much thought. But think back to when you were first introduced to WordPress. It doesn’t have an incredibly steep learning curve, but it definitely takes some time to find your way around. And when you’re a budding entrepreneur with 9,999 other items on your to-do list in addition to building a website, a helping hand is certainly appreciated. One WP Courseware user, Kirk Biglione, has implemented our learning management system plugin in a way which makes it easier for website owners to navigate the maze of options which WordPress offers. Kirk has a long history as a web developer and over the last few years he’s almost exclusively developed his clients’ sites on WordPress. We recently had the opportunity to ask him a few questions about his website, WPApprentice.com, and are very excited to share his story with you. What began as a tool for handing finished sites off to his clients and making the transition smoother for them to make minor changes on their own without incurring hefty hourly fees has led to a full-time business for Kirk. 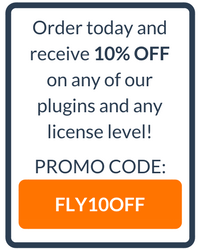 Fly Plugins: I know you have an extensive background in web development, and more specifically with WordPress-powered sites, so you went into building your course as an expert in the topic matter. But what was the initial catalyst which led you toward creating paid training courses? Kirk Biglione: This is going to sound strange, but, my online training business is the direct result of a failed book deal. I’ve been a freelance web developer for quite a long time. Each of my client engagements used to conclude with one or more training sessions — and the inevitable follow ups as clients tried to remember how to manage their websites. At some point, I decided it would be easier all around to create video tutorials. Those early tutorials evolved into the first iteration of WP Apprentice. Initially, all of my tutorials were available for free. I knew it was possible to create and sell courses online, but I was so busy with client work that I never really had the time to put the pieces together. Then one day I got an email from an editor at O’Reilly Media. He was looking for an author to write “WordPress the Missing Manual.” He’d found me through my website and thought I might be a good fit. Of course, I jumped at the opportunity. I started my technical career by learning from O’Reilly books, so writing one was a dream come true. We spent some time working on the structure of the book. Eventually, the outline was approved, and I set out to write a massive book on a very tight deadline — and written in a very specific house style. I assumed that my knowledge of WordPress was all I needed to succeed. I quickly realized that there was more to writing a Missing Manual than being a domain expert. In particular, I never got the hang of the Missing Manual voice. My progress was extremely slow, and the deal was eventually killed. It was a mercy killing! Meanwhile, I had cleared my schedule of all client work so I would have time to write the book. Having been relieved of my authorial duties, I finally had time to build and launch my first online course. In retrospect, things couldn’t have worked out better. I’ve created six courses, and I have a more direct connection with my audience than I would ever have as a traditionally published author. That connection has lead to important insights that have informed my approach towards training. FP: To follow up on the last question, the content is primarily geared toward the needs of a small business website or an e-commerce website. What was your motivation or strategy for designing the course content around the themes that you implemented in the training? KB: I focus on helping business owners because that’s an extension of what I have always done as a developer. Also, as I looked at the market for instructional WordPress material, it became clear to me that most courses are oriented towards developers or people who have at least a little web design experience. Most business owners come to WordPress because they’re told: “it’s easy.” And it is easy to set up a very simple site with a few pages and a basic theme. But anything more requires knowledge that the average business owner doesn’t possess. Not because they’re dumb, but because they aren’t web developers. I have to note that getting to this point was an evolutionary process. I started out teaching WordPress basics. As I got more feedback from members, I realized that knowing how to use WordPress is not the same thing as knowing how to build a website with WordPress. That realization led to the creation of the Business Website Blueprint, which is more of a site building walk-through. FP: Were there any particular aspects of WP Courseware which made it the course delivery plugin you settled on? KB: Yes, definitely! MemberMouse support was key, as that’s my membership plugin. Also, support for MemberMouse bundles (I have a lot of training bundles). I was also pleased with the ease of set up. Converting posts to units could not have been easier. Converting MemberMouse member levels to WPC courses was equally easy. The process of integrating the LMS features into my existing member site was a breeze. I was able to do so in a way that didn’t require me to re-think my site navigation or top level pages. FP: I can see that you’re using MemberMouse for your payment processing and membership management functionality. Obviously, we have an integration between WP Courseware and MemberMouse, but our customers use dozens of different e-commerce and membership platforms and they usually settle on one for a particular reason. What was it that led you to choose MemberMouse as your membership plugin? KB: Actually, I started my site with Wishlist Member. Without getting into too much detail, I outgrew Wishlist pretty quickly. When I started evaluating membership plugin alternatives, MemberMouse was the best fit for my needs. It’s hard to name one feature that lead me to choose MemberMouse. It was a combination of things from the extensive reporting capabilities, to features like “Save the sale” and one-click upsells. Also, the ability to process recurring payments without additional add-ons. That being said, the membership plugin landscape has changed in the years since I chose MemberMouse. While I am still entirely happy with MemberMouse, it’s possible that I might choose something else (Woo, possibly) if I were to start a new membership site. FP: It likely won’t be long before WordPress is powering 30% of the web. So it’s obviously a huge market with a lot of potential and you’re empowering your students to, for lack of a better phrase, build a “real” website without having to resort to a hosted service like Wix or Weebly or SquareSpace which they could outgrow. With so many prospective customers out there, what has been your most effective approach to marketing the courses affordably? KB: I try to be liberal when it comes to making training available freely. The most effective marketing is content that helps my target audience solve their problems. I have a couple of courses that I give away in exchange for an email sign up. A healthy number of those subscribers sign up for one of the paid courses. Besides the free courses, I use my mailing list to promote one-off lessons and free webinars (many based on topics requested by subscribers). It’s important to keep in touch and continue to provide value over the life of the relationship with your audience. I have subscribers who’ve been on my list for years before finally signing up for a paid course. FP: Finally, I know this is not the most profound question I could ask, however, our WP Courseware users ask us for an opinion on this very frequently. 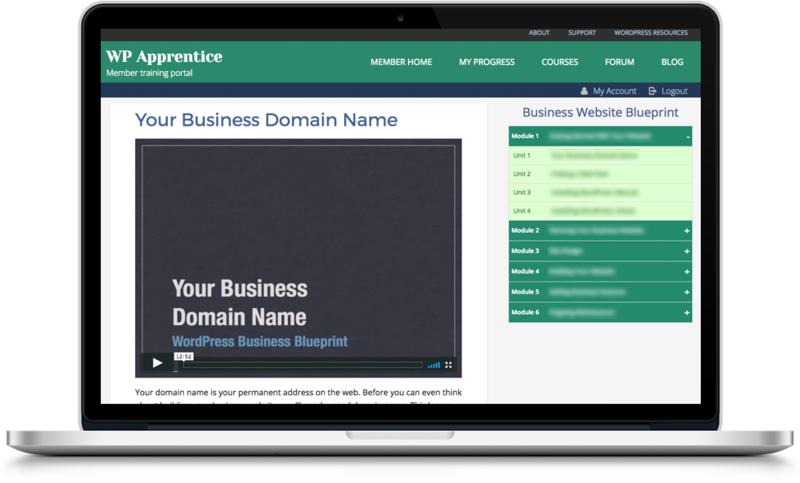 On your site, you run the “marketing” side of the site or the sales and contact pages on your primary domain while using a subdomain for the training portal. Was there any particular reason behind that decision? KB: Originally, marketing and membership were on the same site. Several issues lead me to move the membership site to a subdomain. Even with all of the free content, not everything is available to non-members. And some of the content that is available to non-members is available in a different form. That lead to confusion as members would start consuming content without logging in. Then they’d wonder why they weren’t getting the full experience. It was unnecessarily confusing and lead to a surge in customer support issues. There were also security considerations. I’m not a fan of having thousands of registered users on my public facing site. Not to mention the membership related plugins that aren’t needed on my marketing site. And finally, there’s site speed. I was still using Wishlist Member when I split the site, and it was causing some serious site performance issues. Moving membership to a subdomain resulted in a significant performance boost on my public website. While Kirk has made a few CSS changes to the styling of WP Courseware, he utilizes its functionality nearly out of the box. Upon registering for a subscription to the site and logging in, users arrive at a central member dashboard. As you’ll see in the image below, from this screen students have everything they need in one place…account/profile/billing details, their course listing, their training progress, access to the member forum, bonus resources, and even a link to the blogroll for updates and announcements. The central point of navigation within the member portal is the course progress page. 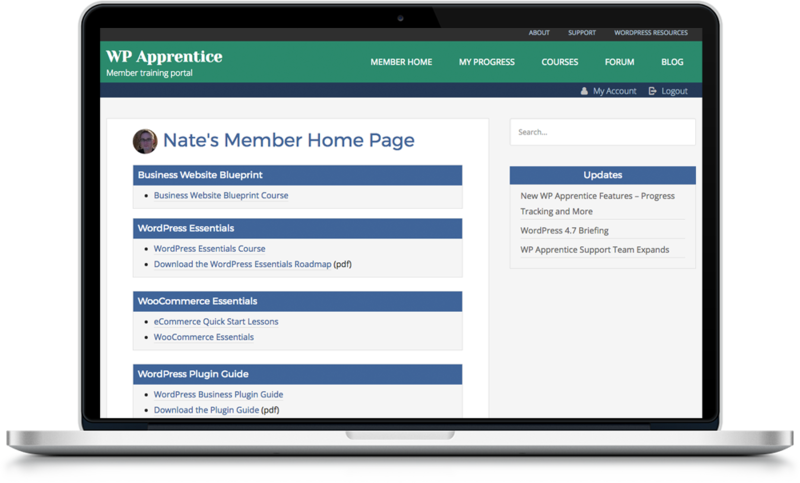 Kirk has placed WP Courseware’s overall course progress shortcode on this member portal page so that they can access a simple overview of their progress in each course. Kirk has also chosen to provide in-unit navigation by using WP Courseware’s course progress widget. Since he allows students to freely navigate the courses as opposed to requiring them to complete units in sequence, students can easily jump to the next training video which is most suitable for their project. *Note: We have intentionally obscured some of the details within Kirk’s specific courses such as individual lessons to protect his intellectual property. Kirk primarily uses Vimeo Pro to host his video content. It’s obviously a very powerful service and cost-effective. Kirk has a massive library of video content and the Vimeo Pro service is scalable and easy to manage. I’d also like to note that although he covers an incredibly broad number of WordPress-related topics in his comprehensive tutorials, most of his videos tend to be around five or six minutes in length. We’ve written about this many times in past blog posts, but all of the highly successful WP Courseware courses we’ve reviewed have opted to create more videos which are shorter in duration. 1. It obviously increases attention and learning retention because students feel less overwhelmed. 2. Second, it provides more points along the course for students to “bookmark” their progress and return later. 3. And finally, with courses such as the ones Kirk is delivering, it’s very helpful to allow students to watch a short video, execute the steps outlined in the video, and then return to the next lesson with an incrementally deeper understanding of the subject matter. We hope you’ve found some useful insights within this case study. 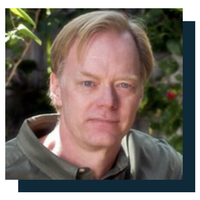 We’re very grateful to Kirk for sharing his story with us as we always feel that these in-depth looks into what our WP Courseware users are delivering can spark some motivation or ideas when you create your own course. And of course, if you have any questions or have your own insights to share with the WP Courseware community related to the topics covered in this post, please feel free to chime in below by leaving a comment!